What is Port & Polish? 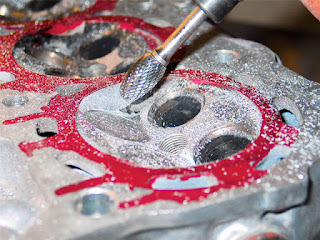 This is what Wikipedia said about P&P: Cylinder head porting refers to the process of modifying the intake and exhaust ports of an internal combustion engine to improve the quality and quantity of the air flow. Cylinder heads, as manufactured, are usually suboptimal due to design and manufacturing constraints. Porting the heads provides the finely detailed attention required to bring the engine to the highest level of efficiency. 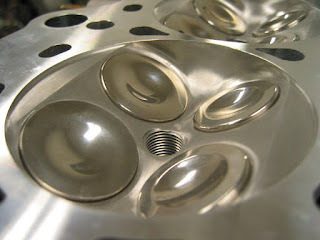 More than any other single factor, the porting process is responsible for the high power output of modern engines. Daily human experience with air gives the impression that air is light and nearly non-existent as we move slowly through it. However, an engine running at high speed experiences a totally different substance. In that context, air can be thought of as thick, sticky, elastic, gooey and heavy (see viscosity). Pumping it is a major problem for engines running at speed so head porting helps to alleviate this. Credit to Wikipedia for this info. That is what P&P. But what is pro and con of this process? Before you send you engine head for P&P, try asking the mechanic if he knows about “air flow bench”. It he did not knows anything about that, just forgot them, find another workshop. As Wikipedia says, Air Flow Bench is a device used for testing the internal aerodynamic qualities of an engine component and is related to the more familiar wind tunnel. Or in my bad language, special tool to ensure all the hole (valve hole) that was P&P are in the same size. Different hole size or porting size to the combustion area can cause imbalance compression ratio and cause engine hard to tune-up. Most of the mechanic just use their 6th sense to replace this useful device. If you car don't have any problem with power, daily driven and plan to used the engine up to 7-10years, recommended not to do this P&P. If for drag and street racing.. YES!! Owh.. baru tau ttg P&P nih, dulu penah dengar je tapi tak tau pe..
Offer your Username and also Zip code on Account. spectrum login In the marketplace, We have couple of applications for Smartphone. But, right now, many computers games can be easily played on our android mobiles or iPhones. Also, developers are developing games that can be compatible with android mobiles. As a result, the very popular gta san andreas data apk is also available on play store but the problem is that you have to pay price for installing and playing it.